Robert McCaw, CAIR; Sue Udry and Sarah Nelson, BORDC & DDF; Yolanda Rondon, ADC; Chip Gibbons, BORDC & DDF; David Duhalde, DSA. Washington, DC – Today, the Bill of Rights of Rights Defense Committee & Defending Dissent Foundation (BORDC & DDF), American Arab Anti-Discrimination Committee, Council on American Islamic Relations, and Democratic Socialists of America delivered the signatures of 88,000 Americans to the House and Senate Judiciary Committees demanding an investigation of FBI and DHS spying on the Black Lives Matter movement, anti-pipeline activists, Occupy Wall Street and other movements for social change. A letter calling for an investigation signed by 131 civil society groups was also delivered. The petition was also promoted by CREDO Action, which collected over 68,000 signatures, and Demand Progress and Roots Action. 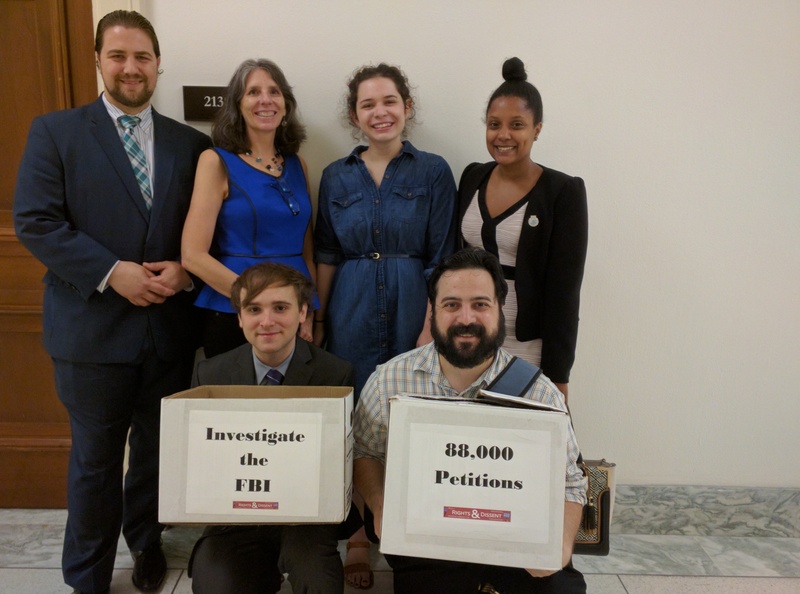 “The sheer number of Americans who signed this petition, as well as, the range of civil society organizations that have called on Congress to investigate the FBI shows that this is an issue of concern to anyone engaged in political activity,” said BORDC & DDF Policy and Legislative Counsel Chip Gibbons. Evidence of improper spying has come to light in recent months and years in documents acquired through the Freedom of Information Act and media reports. The School of the Americas Watch (SOA Watch), a peace and human rights group, was infiltrated and under surveillance for nearly ten years, although the FBI repeatedly concluded the group had “peaceful intentions.” National SOA Watch organizer Hendrik Voss has been active in the campaign to demand an investigation. “The spying on political groups like SOA Watch, Black Lives Matter, and Occupy unmasks the true nature of the FBI as a political police, whose role is to defend the status quo against political dissent,” Voss said. “The Council on American Islamic Relations (CAIR), the nation’s largest Muslim civil rights and liberties organization, stands with the seventy-five thousand Americans calling on the U.S. House and Senate Judiciary Committees to immediately investigate and hold congressional hearings on alleged FBI and DHS abuse of counterterrorism resources to spy on the First Amendment protected activities of civically engaged American citizens lawfully organizing, rallying and petitioning their government,” said CAIR Director of Government Affairs Department Robert S. McCaw.